I’m happy to present a “coming soon” preview trailer for my next documentary called “Heart’s Delight: The William H. Miner Story”. I’ve been working on this off and on for almost 3 years now! It’s a passion project of mine and I’m finally done with all the interviews and am entering the writing/editing phase. It’s a massive undertaking as William Miner had a very complicated and “rich” life! More to come for sure but for now, please check out this short clip. Narration by my friend Greg O’Brien. “Divine Discontent: Charles Proteus Steinmetz” documentary EMMY nominated! This is a documentary I produced with Bruce Carlin. We tried for 7 years to get funding and finally managed to secure a grant to get it made. Our good friends at wmht, the PBS affiliate in the Albany area was the presenting station for it to the PBS system. It is now airing across the country! We decided (and at the suggestion of Dan Swinton of wmht) to put it in for a NY regional EMMY award. That’s a tough market as it includes all of NY City and NJ! So we are up against MSG, Yankeeograpy docs etc… It was announced last week that it has been nominated in the BEST DOCUMENTARY category! Winners will be announced on May 2nd. And here is the open to the show and a round table discussion we shot at Mt. Lake PBS with Thom Hallock for Mountain Lake Journal. The narrator is none other than Kate Mulgrew who is best known as Captain Janeway on STAR TREK VOYAGER and as Red in ORANGE IS THE NEW BLACK. She was a delight to work with and added so much to the finished production. “Songs to Keep” PBS documentary wins EMMY award! “Songs to Keep” is a Public Television documentary about the life of Marjorie Lansing Porter. She was a collector of Adirondack folk music in the early 1900’s. Marjorie would go around and actually record musicians singing to preserve the songs which were handed down from generation to generation. The program won a regional Emmy, and I had the pleasure to be the videographer on it along with Daniel McCollum. It was produced by Paul Larson at Mountain Lake PBS. 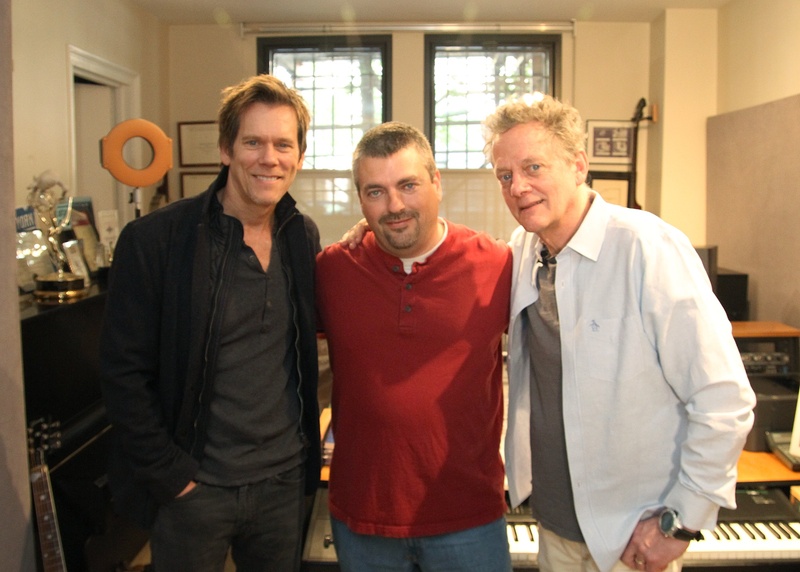 One of the highlights was getting to videotape Kevin Bacon and his brother Michael perform “My Adirondack Home” at their studio in NYC. I’ve worked with quite a few well known celebrities over the years and these guys were a couple of the nicest! Very generous with their time and cooperative to give us “one more take” for the music video portion of the shoot. The song is super catchy, just click the link below to see this section of the show. (The scenic shots from this section were also mostly mine -except the aerial- including the misty road shot which is actually my driveway)! Doing this show is one of the highlights of my year! We have such a great time making them and it’s always fun to “get the band back together” to do so. You see, the host Chris Martine and my co-producer Tim Kramer both used to live near me in Upstate New York, but have since moved to different parts of the country. This was the first episode where we all arrived from different parts of the country. It’s always “interesting” flying with TV gear, and this time I had to go it alone. Luckily, it all arrived along with me (not always the case when you have to check some of it). Soon we were on a journey across the deserts of New Mexico to shoot not just one, but TWO episodes of Plants are cool, too! This episode involves giant hawk moths that fly for miles each night in search of flower nectar — and are thus critically important as pollinators of desert wildflowers. We met up with Krissa Skogen (Chicago Botanic Garden) in New Mexico’s White Sands National Monument and found plant romance happening by the light of the full moon! Shooting in the desert heat (105-110 F during the day) really was a challenge! The camera got so hot, being black, that it sometimes overheated, giving a temperature warning in the viewfinder! Luckily, a few minutes of down time in the shade gets it back running again. I used the SONY EX1 for this, as doing this kind of run and gun shooting (all handheld) is best with that camera instead of the Canon C100. Its always important to use the right tool for the job! Oh yeah, did I mention we had to look out for scorpions and rattle snakes all the while we were working as well! That’s a new experience for this country boy from Northern New York!